How do you begin to market a company whose hundreds of nationwide locations don’t have a consistent brand name on their buildings? That was one of the challenges we took on when we began working with SavaSeniorCare, one of the nation’s largest providers of skilled nursing, memory care and rehabilitative services. Initially, a MadAveGroup discovery team visited the Sava headquarters in Atlanta. For two days, we met with the company’s leaders, diving deep into questions about their wants and needs. 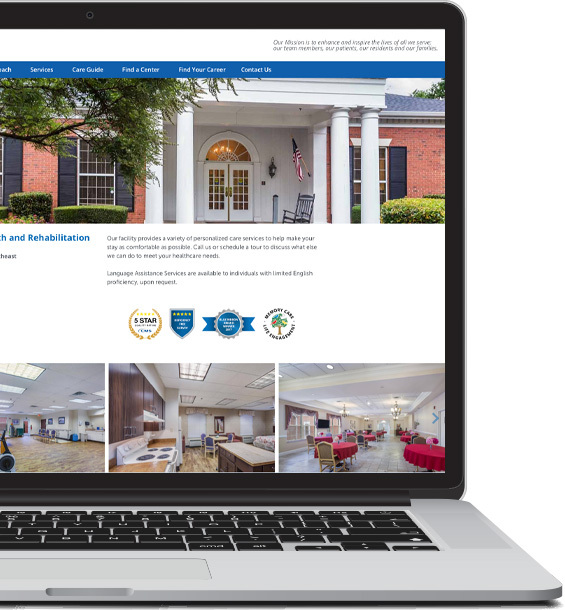 "Sava wanted our help with their brand and the function of their website," said Terry Lesniewicz, Chief Branding Officer of d2i, our branding, advertising and design agency. "And they wanted their individual locations presented as a single brand as much as possible, even though each location retains its own name and management." 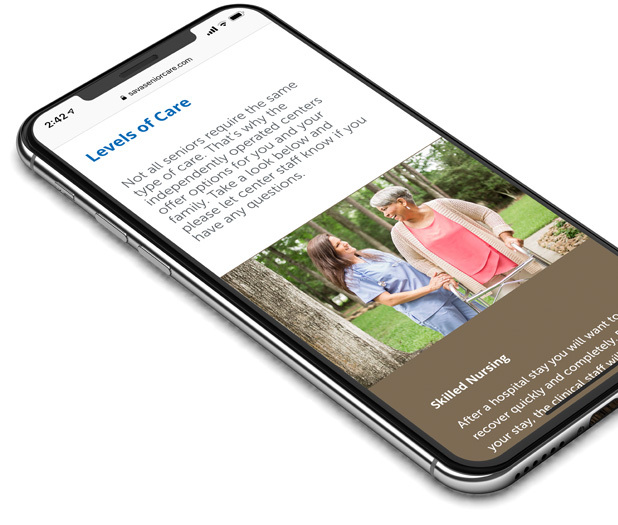 Sava officials also requested a website that would serve as a more effective employee recruiting tool and reduce the anxiety often associated with finding senior care for residents and their families. While the logo and brand colors were off limits, we modernized the look of the site by creating a more open design that embraces white space and fills the screen. The site is also responsive, so the content presents appropriately on all devices, providing an easier user experience. We developed brand guidelines for Sava’s photographer. He applies those standards to the new images he continues to create for the Find a Center pages. The written content is warmer and feels more like a conversation about the Sava story. That’s a change from the bulleted lists of services that dominated the previous site. To generate interest from potential employees, we created a more robust Careers section that allows viewers to search job listings by category, location and title. We also added employee testimonials to provide first-hand accounts of the working environment new hires can expect. And thanks to our digital marketing team, the Sava staff can now update their website confidently. "We built in the tools that allow them to make changes easily," said Steve Timofeev, Director of WebArt. "They add or delete information to an offline version of the site and then pass around the changes to their team. Once all the content’s been approved, we flip a few switches on our end and the newest version of the site goes live. It’s really convenient for Sava, and it gives them complete control over the updating process." The tools WebArt provided also let Sava collect data about their online visitors that they can use to reach out to potential residents or their family members. That allows Sava to respond quicker to requests for facility tours and specific questions. And since the site is designed to make necessary updates to Google Maps and other important SEO information following each update, SavaSeniorCare.com is always optimized to rank higher in search engines. By its very nature, Sava’s business is ever-changing. The company regularly acquires and sells properties. The industry’s employee turnover rate is high. Even the idea of longtime "customers" is not typical. Despite the ongoing changes, though, we’re working to deepen our relationship with the Sava team in order to help them grow and succeed for years to come.